If you only have time for one tour – this is the one! Enjoy a drive along the entire length of Loch Ness, picture stop at Urquhart Castle then a short drive to Inverness. Join us for the day as we travel through some of the finest scenery in Europe. Enjoy a drive along the entire length of world-famous Loch Ness and a visit to the city of Inverness. Our journey north takes us past Stirling with its majestic castle sitting high on its rock above the surrounding countryside. We continue to pretty Callander, the Gateway to the Highlands, and on through Rob Roy MacGregor country. Our coach climbs the "Black Mount” to the stark beauty of Rannoch Moor, an unspoilt landscape extending over 50 square miles and one of the most remote areas in Europe. We make a photo stop in atmospheric Glen Coe, where forty members of Clan MacDonald were slaughtered by the government troops of Clan Campbell. From Glen Coe, we cross the Ballachulish Bridge towards Fort William, a popular tourist centre in the shadow of Ben Nevis on the banks of Loch Linnhe. The grandeur of the Great Glen sets the scene for the highlight of our day: Loch Ness. We drive the entire length of Loch Ness, with the chance to take photographs at Urquhart Castle. There’s even time to enjoy a monster-spotting Loch Ness cruise *. We swap countryside for city as we make the short drive to Inverness, the ‘Capital of the Highlands’, then head south through the naturally beautiful Cairngorm National Park. We make a brief meal stop in Perthshire before continuing towards Perth and the Kingdom of Fife. The final leg of our tour takes us over the Forth Road Bridge, parallel to the iconic Forth Railway Bridge, and back to Edinburgh. 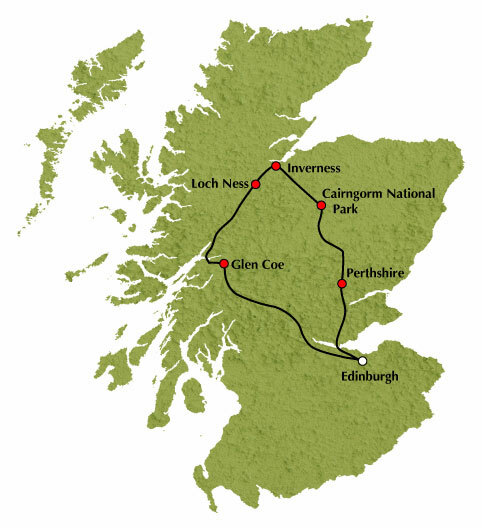 Tour Highlights: Callander, Pass of Leny, Rob Roy Country, Rannoch Moor, Glen Coe, Fort William, Ben Nevis, The Great Glen, Loch Ness, optional cruise on Loch Ness, Inverness, Spey Valley, Cairngorm National Park, Perthshire, Fife and the Forth Bridges.